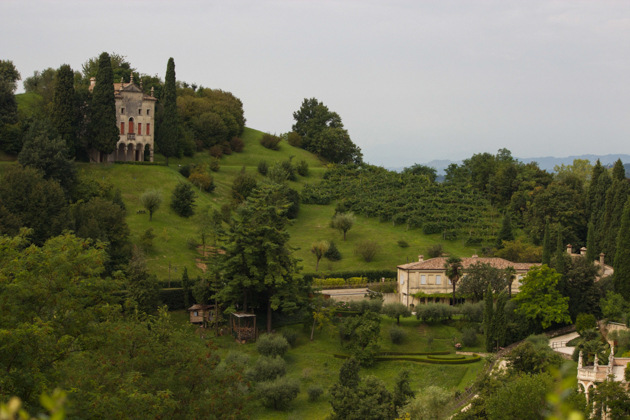 Moneyed Venetians have been holidaying in the Colli Asolani (the hills of Asolo) since the time of the Venetian Republic as evidenced by the many Palladian villas, which were country estates built in the 16th century and designed by Andrea Palladio. 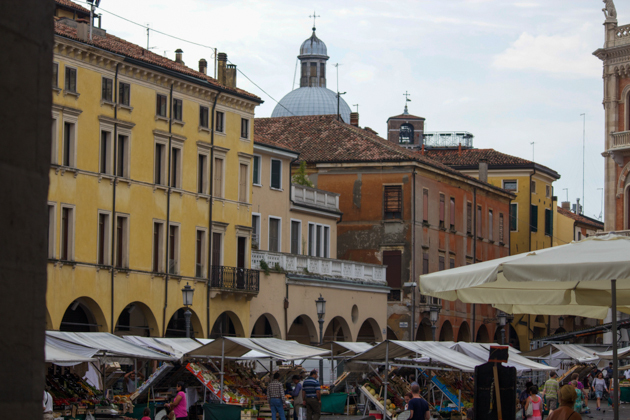 A mere half hour drive to the west of Venezia brings you first to Padova (Padua), a lovely university town with an excellent food market. 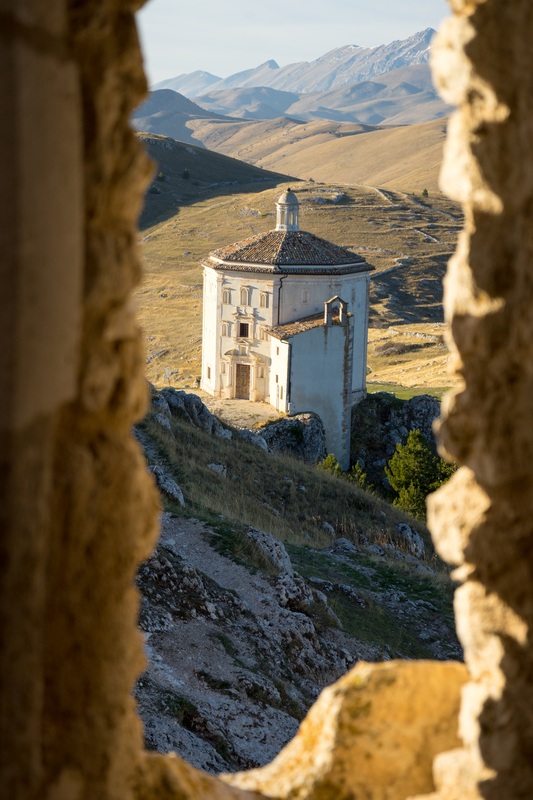 From there, another half hour to the north are the rolling hills of the Colli Asolani complete with romantic medieval towns. 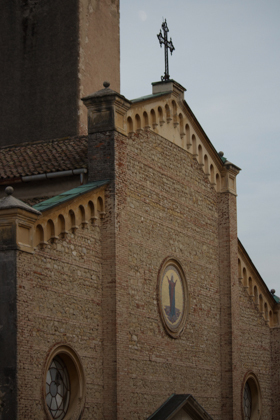 We visited Padova with my mother-in-law, a native of the city. 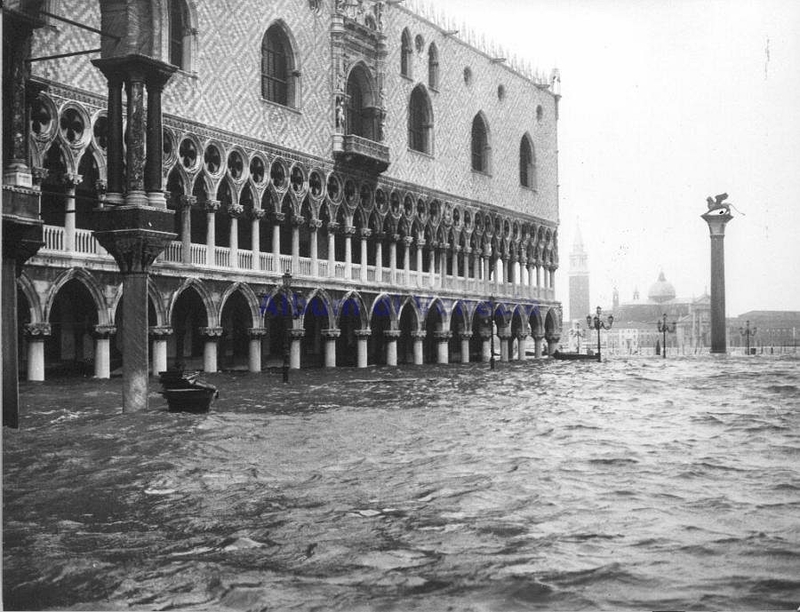 The Venetian-style architecture gave a flavour of the orient but the beautiful piazzas, statues, wide pedestrian walking streets, neo-classical cafés and the odd remaining canal running through the town were traditionally Italian. 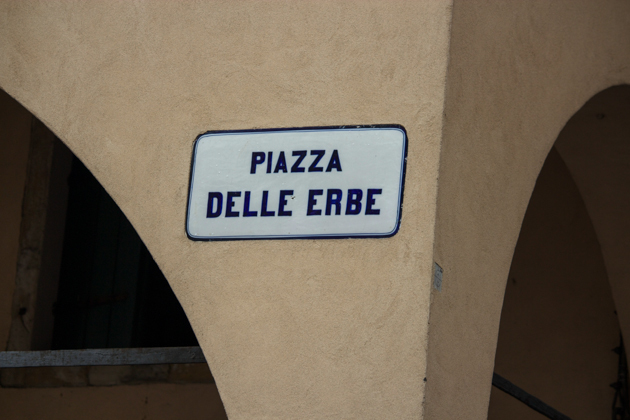 I was delighted to visit the Piazza dell’Erbe, Piazza della Frutta and the Palazzo della Ragione dividing the two piazzas. 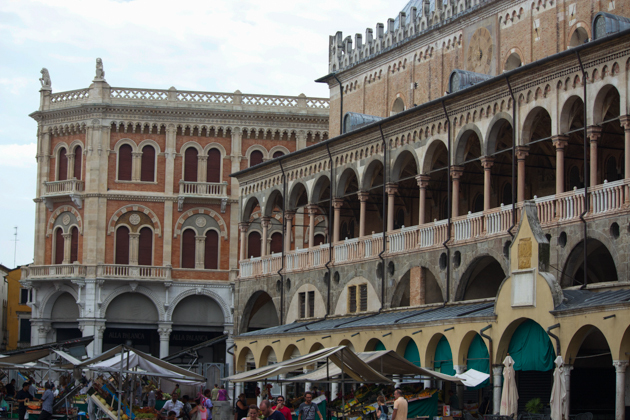 These vast piazzas fill with fruit and vegetable sellers in the morning. 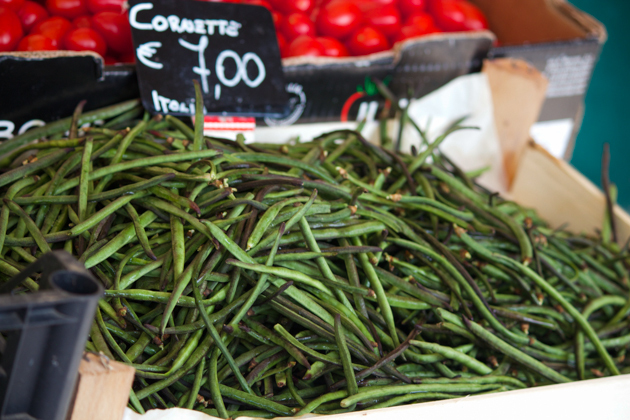 Here one finds local specialities such as the violet aubergine, cornette (a thin type of green beans), all colours of radicchio, mushrooms, chestnuts, Maser cherries, Montello potatoes, wild herbs, asparagus (particularly from nearby Bassano del Grappa), bruscandoli and carletti (types of asparagus like grass) and radiant borlotti beans. 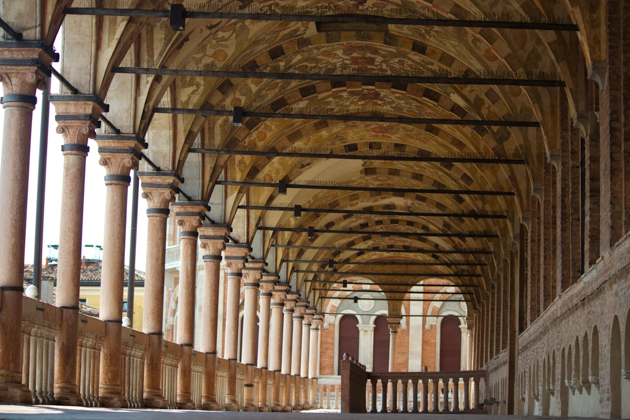 The interior halls running the length of the Palazzo della Ragione house permanent booths and shops of butchers, cheese shops and salumi and salt cod vendors selling national and local specialties such as Asiago cheese from nearby. Try Caffe Pedrocchi, a local historic landmark. 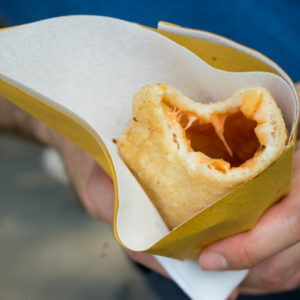 Due to its proximity to Venezia, there are many of the same dishes although they seem to change character slightly. 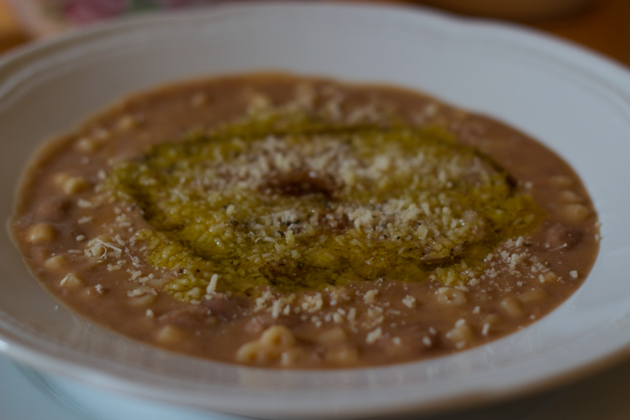 Pasta e fagioli in Venezia is made with tagliatelle while in these parts near Padova it is made with ditalini pasta. 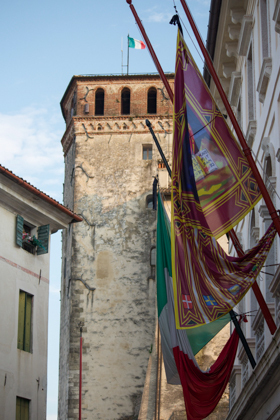 Take a stroll through the old Jewish ghetto to the Duomo di Padova (the cathedral) and visit the Battistero to see the amazing 14th century frescoes by Giusto de’Menabuoi. 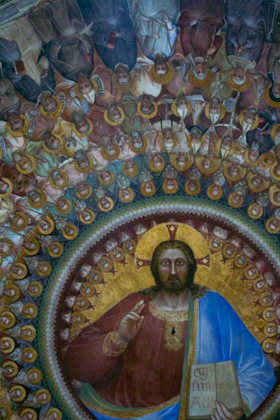 Book tickets in advance to see Giotto’s frescoes in the Scrovegni Chapel as they are some of the most important art works of the early Renaissance period. 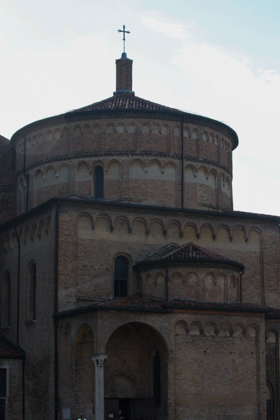 The basilica of Sant’Antonio is also a leading pilgrimage destination. 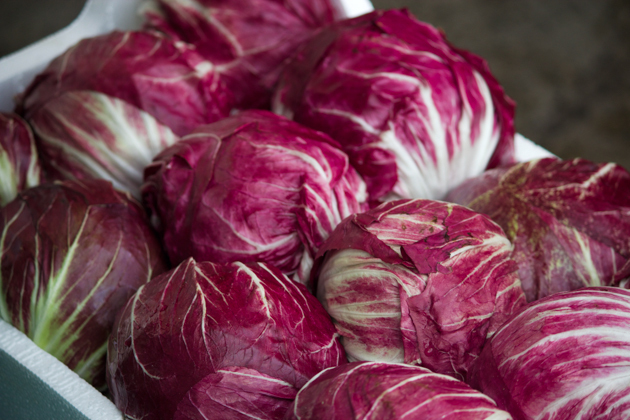 Just north of Padova is Castelfranco Veneto, famous for its red streaked pale yellow radicchio as well as its Duomo, the museum featuring the 16th century painter Giorgione, Villa Redevin Bolasco and its park and the 13th century castle and walls. 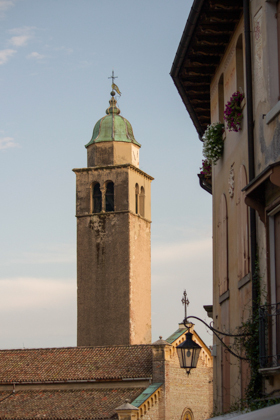 Our destination was Asolo, a hilltop resort town with stunning views of the surrounding countryside. The elegant Villa Cipriani is the real highlight of the town and was one of our favourite places we stayed during our 3 month tour. The hotel is relaxed and comfortable while full of chic clientele. We sat on chairs on the lawn sipping Aperol spritzers watching the children play in the pool. Breakfast was served in the garden with starched white linens amongst colourful flowers. 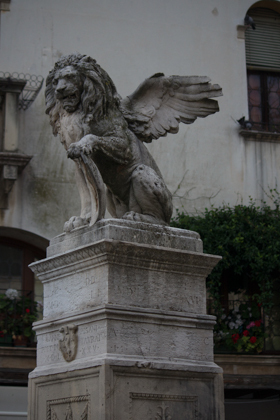 A short walk down the road from Villa Cipriani is the centre of town (Piazzetta S. Pio X) where there is a small fountain, church and cafes. 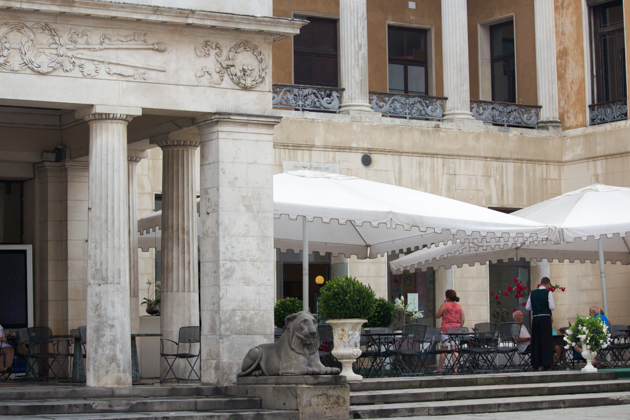 On this square sits Caffe Centrale (Via Roma, 72), the perfect place to sit for an aperitivo prior to dinner. Many of the restaurants we were keen to try such as Ai Due Mori, Ca’Derton and La Trave were closed for holidays during our visit but came highly recommended. 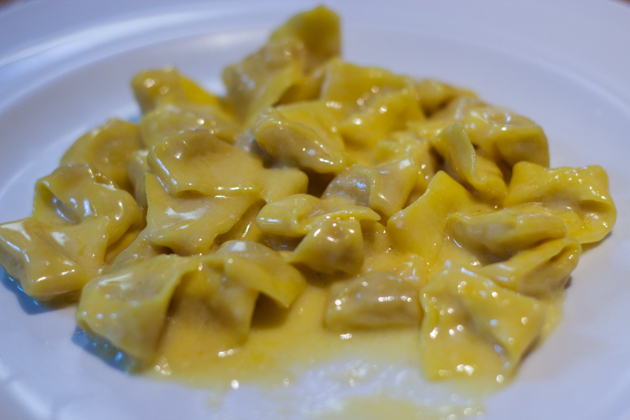 Instead we enjoyed spider crab filled ravioli (granseola ravioli) and thick fresh pasta with duck ragu (bigoli all’anatra) at Villa Cipriani. In terms of shops, the Gastronomia Sgarbossa (via Browning, 151) is a good place to try cheeses aged in red wine and hay such as Morlacco as well as Malga and Asiago cheeses. 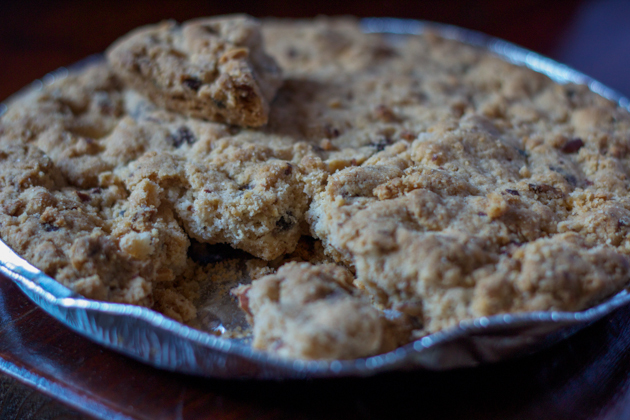 They also sell a typical local cake, Pinza as well as other homemade breads, pastries and fresh pastas. 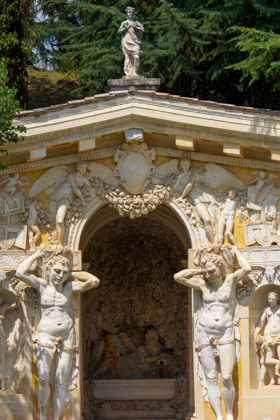 Outside Asolo in the hills (Colli Asolani), there are many palatial Roman-style villas. We even saw one squeezed between strip malls. We visited the grand Maser Villa. Inside the villa are extraordinary frescoes by Veronese demonstrating the wit of the artist with names like room of the little dog (find the small dog painted on the wall), room of the oil lamp (with a small oil lamp descending from the ceiling) and frescoes of people emerging from fantasy doorways. 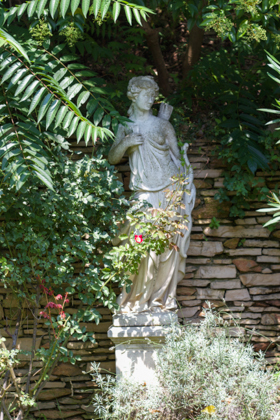 The majority of the villa is still occupied by a Countess and we glimpsed through glass panels into her private quarters. 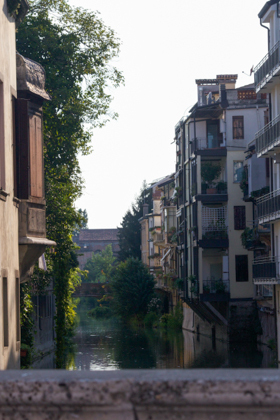 Nearby to Asolo is the historic town of Bassano di Grappa where the Nardini and Poli distilleries have been producing grappa since the 18th and 19th centuries respectively. There is also the Poli Grappa Museum near the unmissable Ponte Vecchio (a bridge traversing the Brenta River designed in the 16th century by Andrea Palladio) which can be visited. 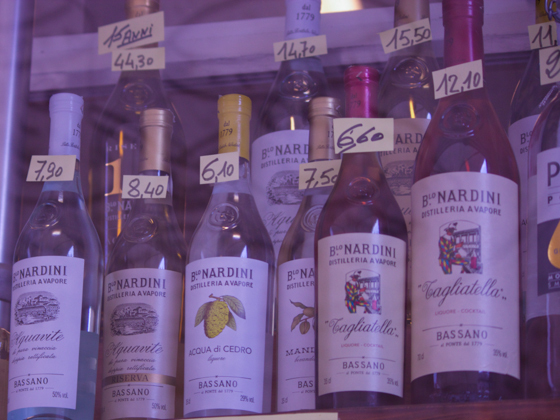 Nardini has a tasting tavern on the bridge where its grappas can be sampled with an appointment. 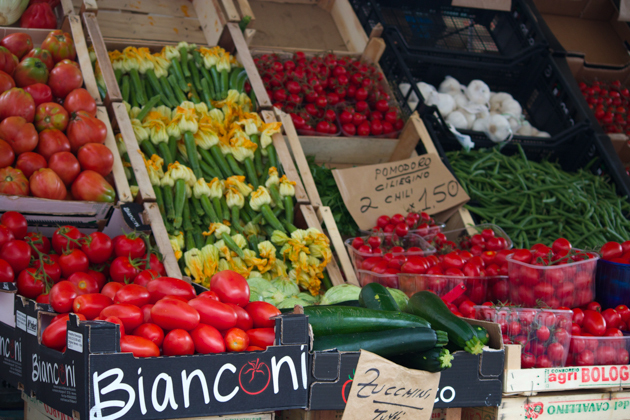 Bassano del Grappa is also famous for its asparagus, both green and white, and celebrates with an asparagus festival in April every year. 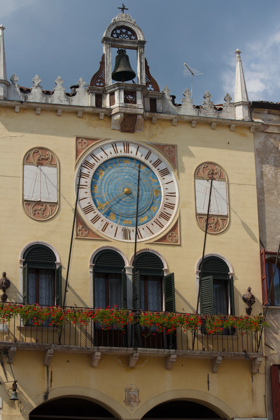 The Piazza Libertà is a nice place to have a drink and look at the 24 hour clock and the frescoes on the buildings. 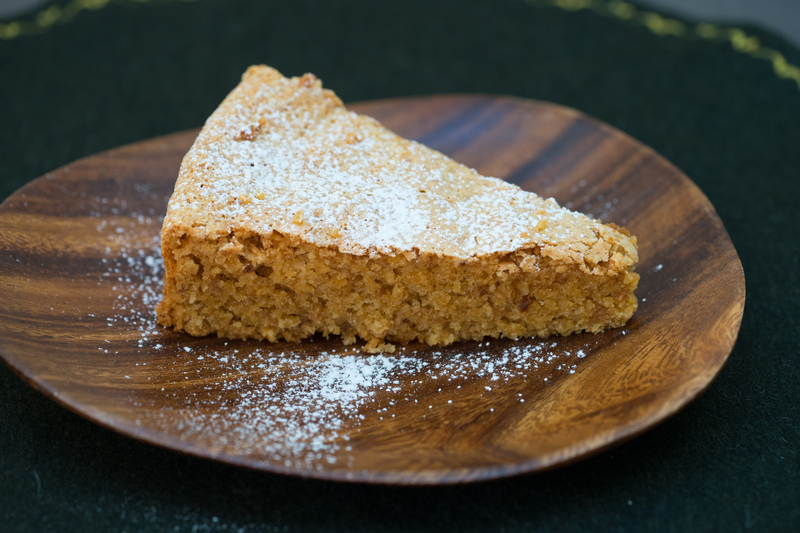 There are several local specialities that are similar large cakes that are crisp and crumbly such as the torta montanara, a large biscuit flavoured with nuts and chocolate. 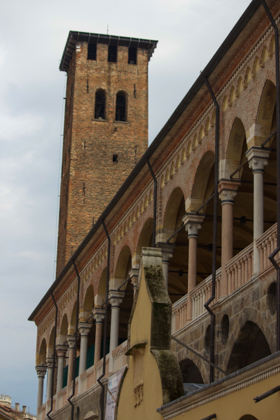 There are many other historic towns around Padova including Noale, Mirano, Mira, Stra, Piove di Sacco, Selvazzanto Dentro, Este and Monteselice. Activities in this area include cycling, trekking, horse riding, golfing and visits to caves. 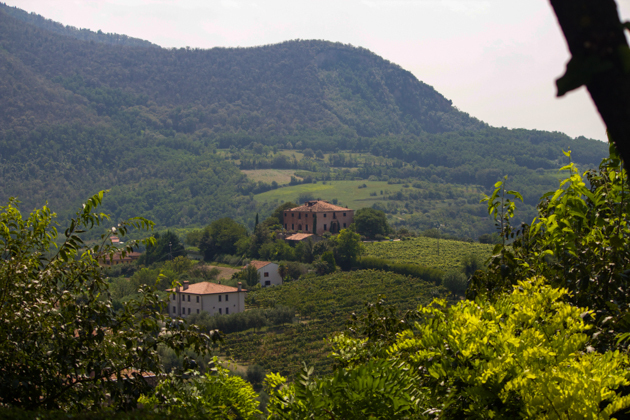 To the southeast of Padova is the Colli Euganei (Euganean hills), volcanic hills forming a regional park known for hot springs and its red and white wines. 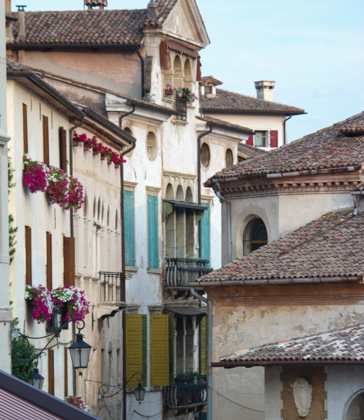 From Padova, my mother-in-law used to holiday here in the summer. 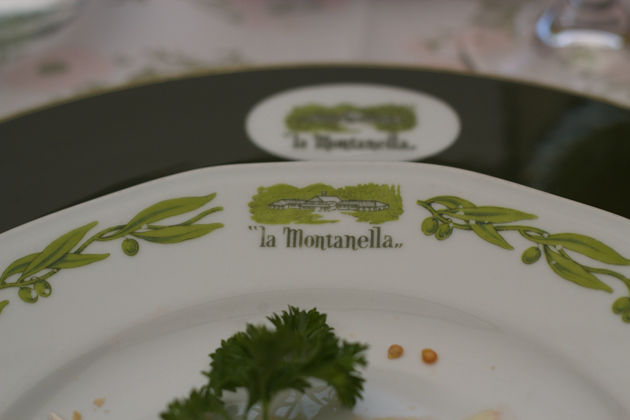 We found many excellent countryside restaurants such as La Montanella, located outside Arqua Petrarca near Monteselice and Este. 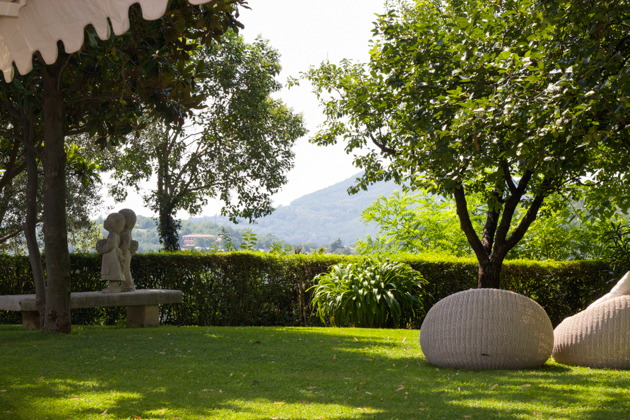 La Montanella has an inviting terrace overlooking a lawn. In the summer eat outside amongst the lavender and orange trees. 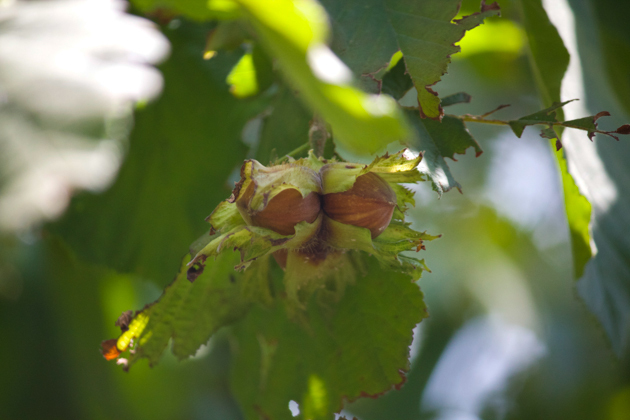 Take a wander up the hill to see hazelnut, almond and olive trees while you wait for your food to be served. Or in the evening have a drink on the lawn sitting on a lounger with candlelit lanterns hanging from the trees. 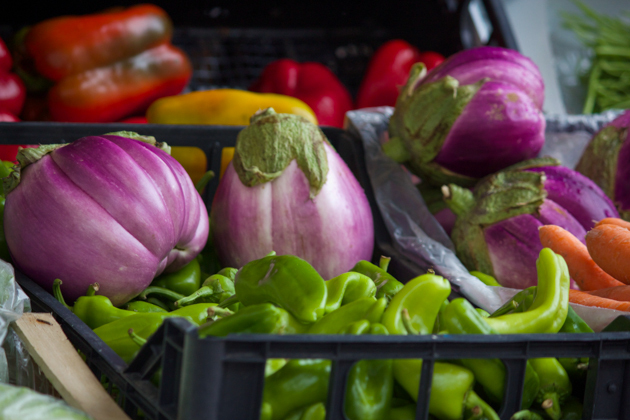 All the vegetables served are from their own garden and pastas and pastry are all homemade. 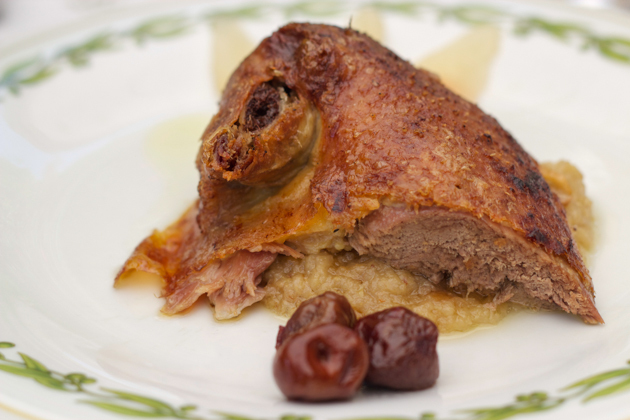 They also feature historic recipes such as papero alla frutta (a duck with fruit recipe from 1600) and toressani con salsa peverada Padovana (a 50 year old recipe for pigeon with a typical Padovan sauce). 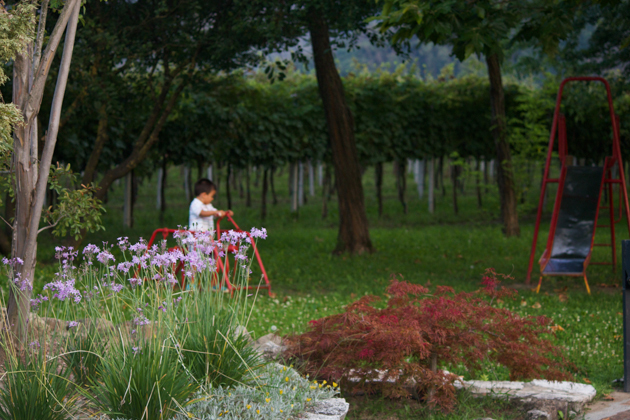 Other restaurants worth a visit are La Tavolozza, a lovely osteria in the countryside with a lawn for the children to play next to the vineyard, and Da Mario, a truly excellent restaurant with very well executed dishes such as moeche e melanzane viola da chiogga fritte (tempura fried aubergine and soft-shelled crabs) and homemade pastas. 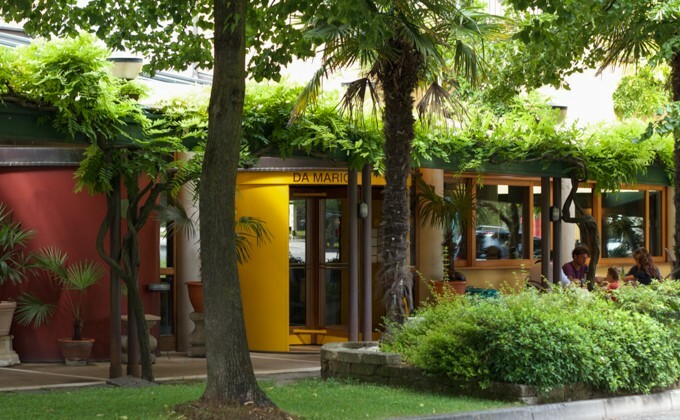 While in the area, enjoy some of the local terme (hot spring hotels). Have you been to the area and found other niche places you want to share? Please leave a comment below. If you have friends or family who may enjoy this post, please share. Place in a medium saucepan the olive oil, onion, celery, garlic, rosemary and parsley. Heat the pan over medium heat and cook until the vegetables are soft, about 10 minutes. Add the beans and their water and cook for 10 minutes. Adjust the salt to taste and add the pasta. Cook for the time indicated on the package of pasta. Remove the rosemary and discard. The consistency should be like a thick soup. 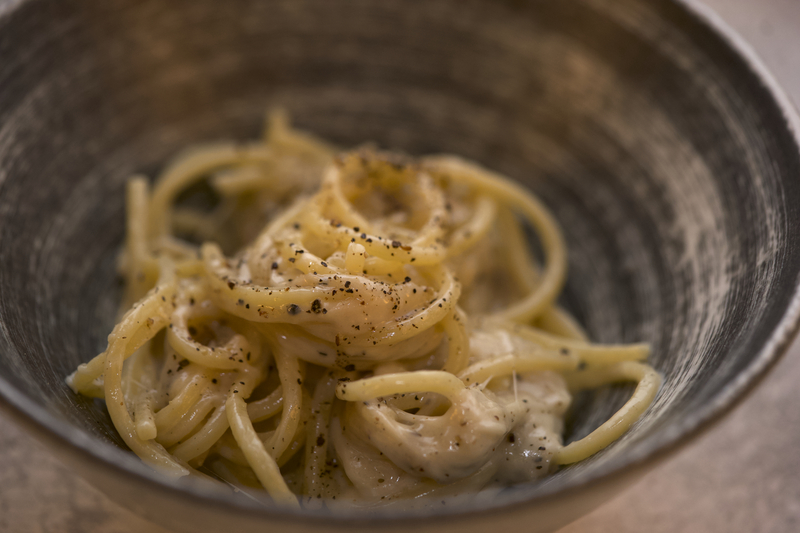 Serve and top with any combination of olive oil or butter, balsamic vinegar, freshly grated black pepper and grated Grana Padano cheese. A grand old cafe operating since 1831. 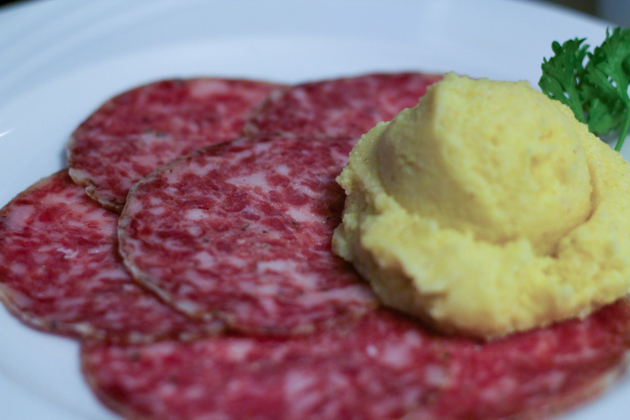 They also serve local salumi and cheeses and pastries from Pasticceria Racca (known for its chocolate). 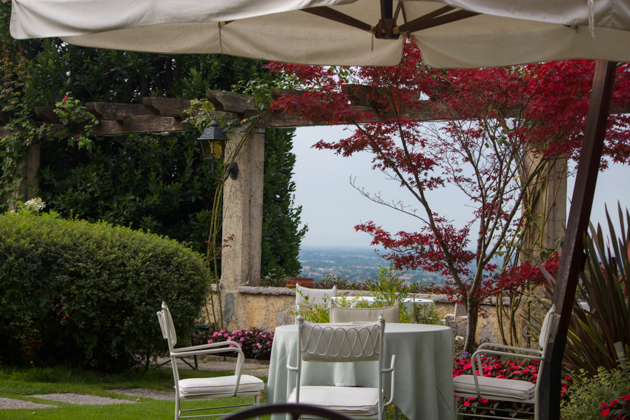 An osteria set in the Colli Euganei park with a splendid view of the hills. 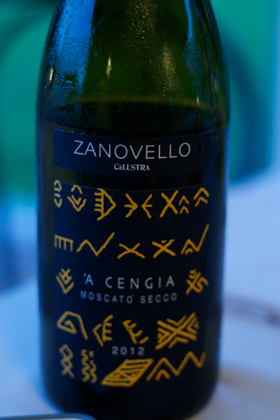 The chef makes use of local seasonal produce and serves locally produced wines. This restaurant has truly excellent cooking using local ingredients. While its atmosphere is not particularly special, the skill of its cooks elevates it to a whole new level. Unmissable. 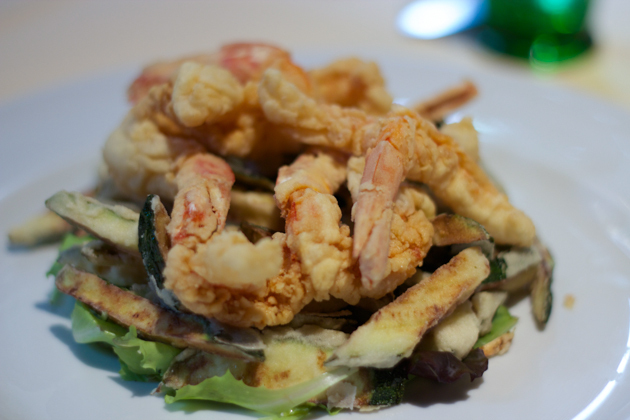 Recommended dishes: moeche e melanzane viola da chiogga fritte (tempura fried aubergine and soft-shelled crabs), tortellini, gamberi e zucchine fritte (tempura fried prawns and courgettes), tagliatelle con ragu d’agnello e finferli (tagliatelle with lamb and chanterelle mushroom sauce) and homemade gelato. Lovely restaurant set in the Colli Euganei. 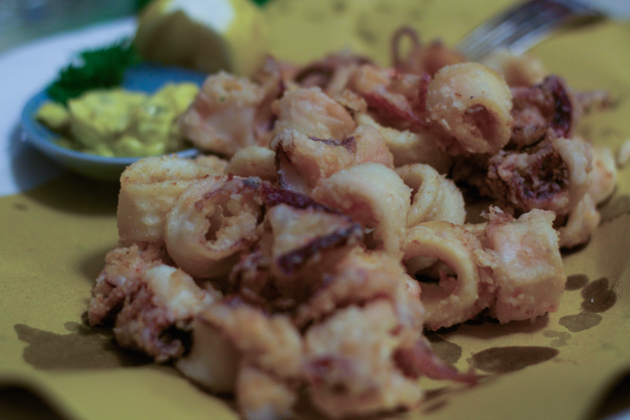 The menu is divided into meat and seafood options. 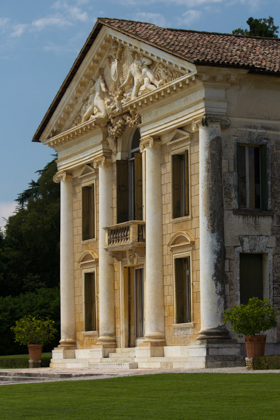 A 16th century Palladian Villa located in the hills outside Asolo. Famous frescoes by Veronese. Free tastings and tours available with an appointment. 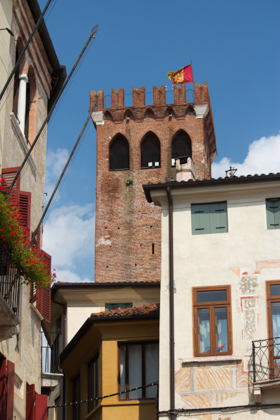 The historic towns of Castelfranco Veneto, Noale, Mirano, Mira, Stra, Piove di Sacco, Selvazzanto Dentro, Piove Di Sacco, Este and Monteselice. 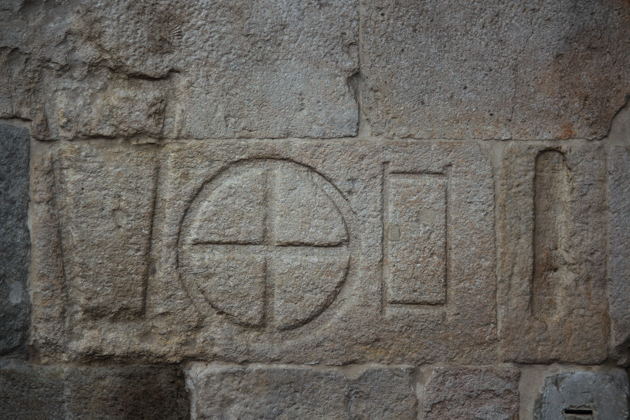 « What do Homer Simpson and Joseph (as in Joseph and Mary) have in common?